Peter wants to thank his mate Mick for all his help, his welder and his garage, as well as Hyundai Blacktown for their continued support - even though this is no standard Terracan, and his wife for time off out in the shed to build the family escape machine. Did you know Terracan stands for ‘King of the Land’ – Terra means land and Khan means King or ruler! 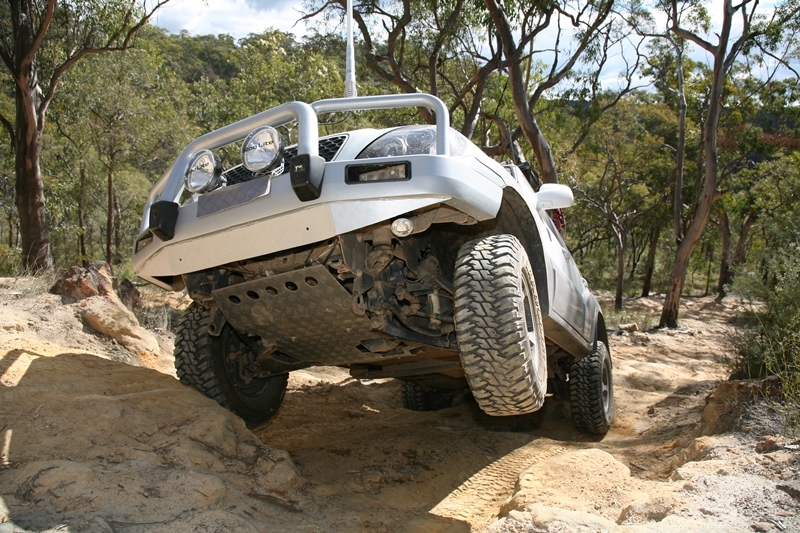 So, now you can safely take your Terracan ‘out and about’ and rule the road – that’s what they were made for! Back in 2006, Peter Turnbull was turned away by most aftermarket suppliers while hunting for gear to bolt on to his newly acquired Terracan. “Oh yes, yes, yes I bloody-well Terra-CAN”, was Peters response – “even if I have to knock up the damn stuff myself”. Peter was adamant that even though he couldn’t purchase a heap of off-the-shelf aftermarket gear for his Hyundai, he wouldn’t rest until he had all the gear he wanted on his wagon to make it the capable tourer he needed – and there was no way he was going to trade in for a Toyota or Nissan! While Peter did dish out his hard earned dollars for a few items, he still had to extensively modify much of it to get the most out of them for off road use. Add the fact that most gear was picked up second hand from swap meets, fellow Terracan club members and the like, Peter has built himself a very capable tourer at minimal cost. Of course, there was a huge amount of time and head-scratching spent in the shed and the internet on R&D. Peter tells us that in Australia, it was quite hard to find companies to take him seriously, compared to overseas (Korea and Iceland) there are not only plenty of accessories, but also willingness to help out. 35-inch tyres, 6-inch lifts and lockers are common fare O/S for Terracan owners and Peter gleaned a heap of useful information from websites like www.australia4wd.com, which hosts many subsidiary forums including www.terracan.australia4wd.com. Peter tells us he initially choose the Terracan due to it’s hot pricing, but also at the time, it was one of the few mid-sized wagons that offered a separate chassis 4WD with low range gearing, rear coil springs and a great performing common rail, intercooled turbo diesel engine. It came with a 5 year warranty and seeing as they had great service from a previous Hyundai, figured they couldn’t go wrong. There aren’t too many manufacturers that will have a bar of modified 4WD’s, but Peter still gets plenty of after sales help from his local dealer at Blacktown, Sydney. Thumbs up to Hyundai Blacktown – will you be stocking lockers, body blocks and wheel carriers anytime soon? If it doesn’t fit, or it doesn’t do the job needed – then modify it to do so. So says Peter Turnbull! While the front aluminium TJM T1 bull bar does the job, it doesn’t provide a particularly good approach angle – and Peter reckons it looks a bit ordinary with its deep main horizontal section. So, with angle grinder in hand, the side wings were trimmed to taper upwards to resemble the TJM T15 bar, which is far superior in approach angles and overall clearances…oh and looks a hell of a lot better to Peter. The standard Hyundai plastic infill, between the grill and bull bar, has been dramatically trimmed and reduced to allow the bar to be raised 40mm and moved rearwards 30mm – providing even better approach angles. While a factory cargo barrier was purchased, it had to be modified once Peter and his cabinet maker mate finished the rear drawers. With the box in place, the contents of the rear cargo area is easier to keep packed neat and tidy and also makes accessing that gear much easier. A 40 Litre Waeco fridge fits on top, while all tools and recovery gear are kept in the drawers. To lift the Terracan a total of 100mm, Peter has used a combination of 4-inch (100mm) taller Lovells coil springs at the rear and replacement Ironman torsion bars at the front – all of which are controlled by longer-than-standard Ironman shocks. Then, Peter procured a tapered body lift kit, which provides 55mm of body lift at the front row of mounts, 30mm at the second, 12mm at the third, just 9mm at the fourth and 0mm at the most rearward body mounts. That gives the full 100mm coil lift at the rear, matched by the front 55mm body block plus 45mm Ironman raised torsion bar. While this does separate the body from the chassis in a wedge effect, it does ‘set’ the stance of the wagon as though it were factory. The standard 2.9L intercooled turbo diesel engine is a good performer and provides reasonably good fuel consumption, but more is always better, so Peter purchased and fitted a TDC Technologies Power Chip to help turn the larger diameter tyres and increased weight of the Terracan. The chip has been particularly helpful when towing the family’s weighty camper trailer. A 100 Series LandCruiser rear dust deflector, with minor modification, is fitted to the rear of the Terracan to help keep dust and rain off the rear window. A Toyota Surf dash pod gauge set tells Peter his altitude, yaw and pitch – or perhaps whether of not his Terracan has rolled over after getting half way up a hill. Peters gone to a lot of trouble to see his way on the track at night time; not only has he fitted a pair of 180mm Roo Lights, but also a rear facing work light and two small lights under the bull bar for rock lights. A Uniden radio has been fitted to the central dash panel and a Scan Gauge to the steering column to keep track of under bonnet vitals. To ensure Peter and family can find there way home, a Logic Gear GPS running Ozzi Explorer is fitted. The GPS also has blue tooth and the ability to run two cameras and MP3 files. A Redarc dual battery system, with secondary N70Z heavy duty battery, was fitted to ensure all extra electronic gear performs as planned. Most aftermarket accessory companies can supply bumper bar replacement wheel carriers for the majority of makes – but not for a Terracan…sorry. Peter was adamant he needed two spares while touring, so set about manufacturing one himself. The actual swing arm was picked up for sixty bucks at a swap meet and had once served on a Toyota. With steel, welder, grinder, silver paint, plus a heap of eagerness, Peter managed to craft a swing out carrier, complete with gas strut, to carry a second spare wheel and rear-facing work light. He’s also had the forethought to cater for his good wife being able to open the usually-hard-to-operate over centre latch, by lengthening the actuating lever – simple and effective. The lengthened lever also aids in allowing your hand to access the lever without fowling on the larger-than-standard tyre. The side wings have been moulded to fit in with original mouldings on the Terracan and also allow attachment of the mudflaps. All up, Peters’ handy work provides much stronger rear end protection, increased departure angle, second spare wheel and a much talked about accessory. Many people ask “Where d’ja buy that from mate” – the ultimate compliment for home made gear! Peter’s Terracan will soon have a few more must-have-‘cause-he-wants-‘em toys fitted. A front Lokka automatic diff lock, larger diameter exhaust, onboard water tank, reversing camera, lengthened diff breathers and an electric winch round out the easily-achievable, while a solid axle swap for the front independent suspension is at the top of the ‘dreaming’ list. Sadly, Peters Grandfather passed away some time ago. Not one to let things go to waste, Peter figured the steel checker plate disabled ramp that aided dear Ol’ Pop gaining access up and down the stairs, could be transformed into a protection plate under the Terracan. So, with a bit of cutting, bending and drilling, Pop’s old ramp now protects his grandkids little white wagon while out and about in the rough terrain. To compliment Pop’s checker plate donation, Peter has also lined more of the underside of his Terracan with steel to protect all the running gear. That’s ingenuity and one way to remember loved ones as much as possible. Peter and his Terracan are living proof that you should never take “NO” as an answer, when it comes to doing something different. Try taking the attitude of “YES – I can do it” – you’ll be amazed at what you can create that is a little different to the norm. Perhaps that’s where the ‘CAN’ in the ‘TERRACAN’ originates from!